Samsung Mobile had a great year in 2017, with the flagship S and Note line-ups doing well commercially. There was a change in the company's approach towards mid-range and budget-oriented devices, with the OEM providing regular updates for almost all the smartphones. It was required to win back the trust of Samsung fans, especially after the Note7 fiasco. 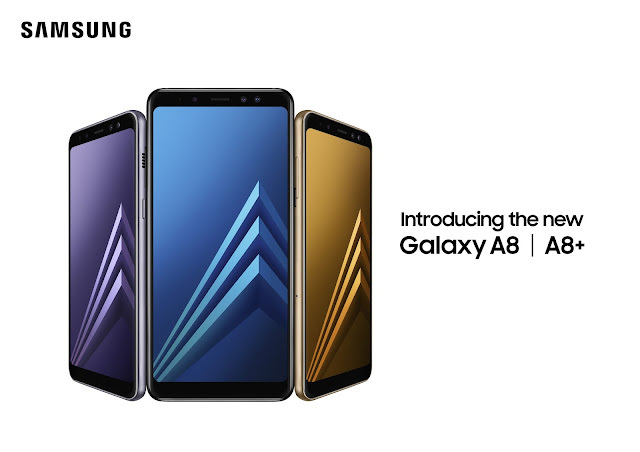 While the flagships for 2018 will be revealed later in the year, Samsung has went ahead with announcements regarding the A series. 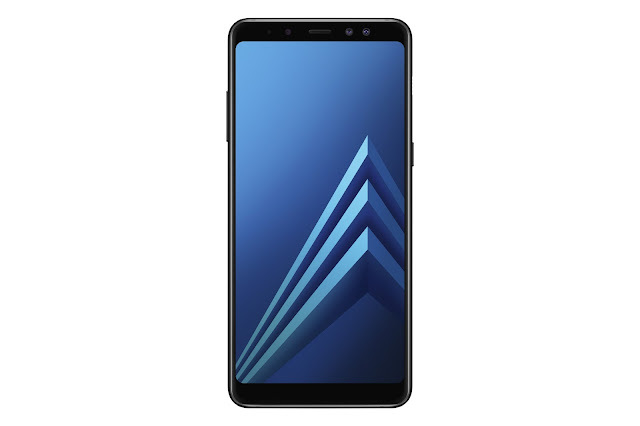 Samsung revealed their latest smartphones, the A8(2018) and A8+(2018) earlier today. These are essentially the successors of the 2017 variants of A5 and A7 respectively. These are also the first non-flagship Samsung smartphones to feature Infinity display. Both the smartphones have exact same hardware except the battery capacity, RAM and display size. Th smaller A8 sports a 5.6 inch display while A8+ has a 6 inch one. The Super AMOLED displays have a resolution of 2220 x 1920 pixels with an aspect ratio of 18.5:9. These are the first A series smartphones which will be compatible with Samsung Gear VR. 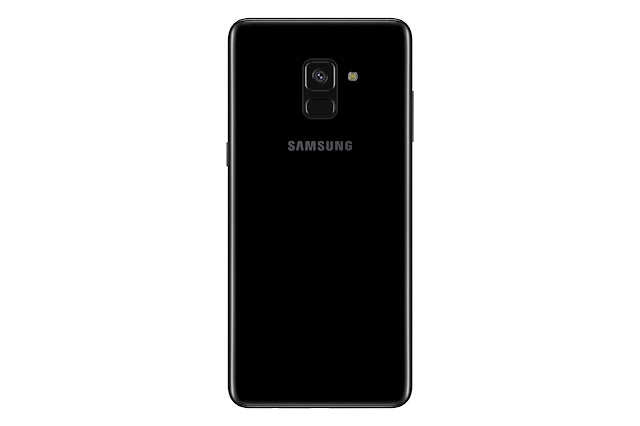 The build quality is similar to the Samsung flagships with glass to the front and back, and it also has IP68 rating, which means it is as water and dust resistant as the current flagships. A8 will have 4 GB RAM while the A8+ will have an optional 6 GB RAM variant. Internal storage options are 32 and 64 GB which can be expanded by up to 256 GB via external microSD card. The octa core Exynos 7885 chipset has a combination of 2.2 GHz dual core and 1.6 GHz hexa core. One disappointing factor is that despite being a 2018 smartphone, it will be coming out with Android Nougat 7.1.1. The rear camera has a 16 MP sensor with an aperture of f/1.7 and PDAF. Video capabilities are enhanced with support for VDIS and hyper-lapse feature. Secondary camera is a dual lens setup with a 16 MP FF sensor residing with an 8 MP sensor, both having slightly narrower aperture of f/1.9. The additional lens helps in depth sensing and the Live Focus feature is present. In terms of looks, these new smartphones are very similar to this year's S and Note series, barring two minor changes. The speaker grill which was usually found at the bottom besides the USB port has been moved to the right side above the power button. The next difference is one of the most awaited one - the placement of fingerprint scanner. 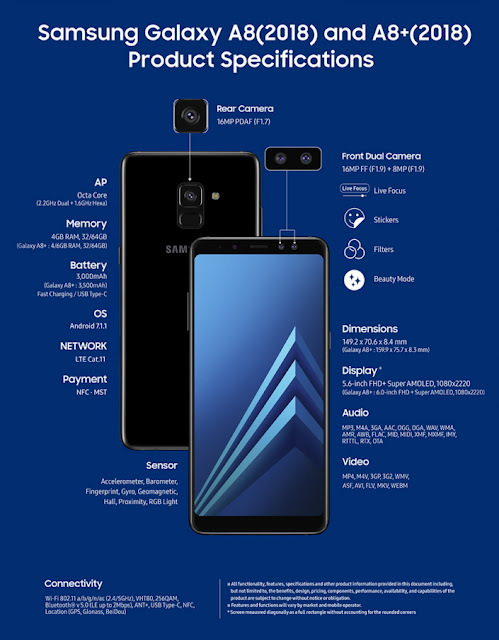 The sensor was next to the rear camera lens, but with the A series phones, it has been moved to below the lens, making it a lot more convenient to reach out for. Other included sensors are Accelerometer, Barometer, Gyro Sensor, Geomagnetic Sensor, Hall Sensor, Proximity Sensor and RGB Light Sensor. Connectivity features include dual band Wi-Fi, Bluetooth 5.0, USB Type-C, GPS, GLONASS, NFC and MST. The inclusion of MST means that the full version of Samsung Pay will be available and it will work with older swipe machines as well. All these are powered by a 3000 mAh battery and 3500 mAh battery in A8 and A8+ respectively, with support for fast charging. The smartphones will be available in four colors - Black, Orchid Grey, Gold and Blue. The pricing and availability details were not revealed, but we will most certainly be seeing these at the CES 2018.